No matter whether you’re going back to school or just graduating high school, choosing a college major can be a challenge. Not only do you want to choose a job that you enjoy, but you want to make sure it pays well too. 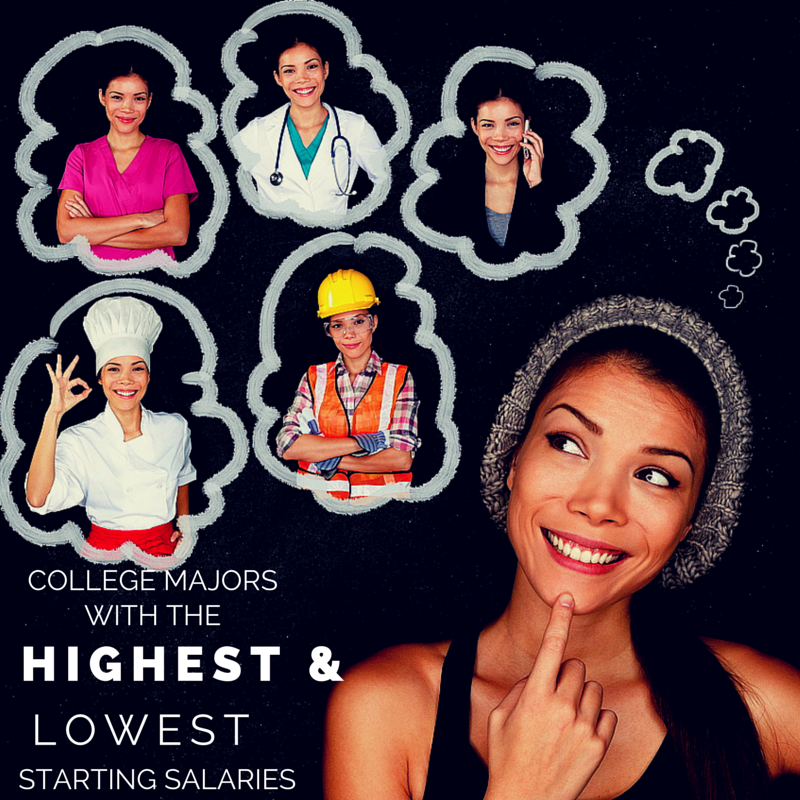 We’ve rounded up the top college majors with the highest and lowest starting salaries to help you find a smart career path. And jobs related to any one of these majors can be found on job search sites like JobTonic. An electrical engineer is involved in all aspects of the manufacturing of electrical equipment, including radars, electric motors, navigation systems and power generators. Most electrical engineers work in research and development fields, but they can also be found working in manufacturing, engineering services firms and even the federal government. A bachelor’s degree or higher is required for this job, and 4% growth is projected between 2012 and 2022. A computer engineer researches, designs, develops and tests computer components and systems, like memory devices, processors, routers and circuit boards. They’re responsible for the rapid advancements in computer technology. A bachelor’s degree or higher is required for this job, and 7% growth is expected in the field between 2012 and 2022. A mechanical engineer designs, developers, builds and tests mechanical devices, including machines, tools and engines. Most work in typical office settings, but may visit the worksite on occasion. A bachelor’s degree or higher is required to enter this field. A graduate degree will allow you to advance into a managerial position. A career in early childhood education will earn you the lowest starting salary, but you’ll only be required to earn an associate’s degree to get started. Those who enter this field will educate and care for children who have not yet entered kindergarten. Tasks may include teaching writing, reading, science and other basic subjects that young children can understand. Early childhood education teachers may work in private or public schools, charitable organizations or childcare centers. Some work year-round, while others work just 10 months out of the year. The child and family studies major is similar to early childhood education, but these programs offer a wider range of career opportunities. Those who enter this major may work as a family life educator, child welfare or human services worker, youth worker or in early intervention special education. An associate’s degree or higher is required to enter this field. Those who work in the culinary arts oversee daily food preparation at restaurants and other eateries. They might direct the kitchen staff or handle food-related issues. A chef or a head cook may work in a private home, restaurant, corporate kitchen or other establishment that serves food. They often work weekends, holidays, late evenings and early mornings. While formal college education is not required, most who enter the field will attend a culinary arts school before entering the field.